Sterling was the subject of alleged racial abuse on Saturday evening. CHELSEA FOOTBALL CLUB has suspended four supporters from attending games at Stamford Bridge, as investigations into allegations of racial abuse towards Raheem Sterling continue. 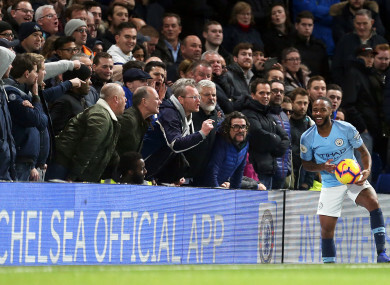 The Manchester City player was the subject of verbal abuse from a group of Chelsea fans as the 24-year-old approached the touchline during Saturday’s Premier League game, an incident that was caught on camera and quickly went viral on social media. In a statement, Chelsea said if there is evidence of ticket holders taking part in any racist behaviour, the club will issue ‘severe sanctions, including bans’ and that it fully supports any criminal prosecutions, as police continue to investigate. “Chelsea Football Club has suspended four people from attending Chelsea matches pending further investigations into allegations regarding the behaviour of supporters towards Raheem Sterling during our match against Manchester City on Saturday,” the statement read. Email “Chelsea suspend four fans for alleged racial abuse of Raheem Sterling ”. Feedback on “Chelsea suspend four fans for alleged racial abuse of Raheem Sterling ”.